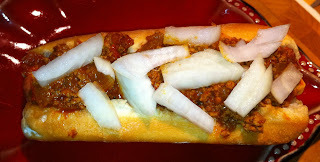 My chili on a classic Oscar Mayer bun length dog….mustard with fresh onions. The chili was good…a lot of flavors. The dog was okay….really just a delivery vehicle. The bread needed steaming and was stale even thought it was bought today. The chili deserved better bread and wiener. At least it all looks good! My wife tends to buy German sausages for this sort of thing. The tend to be the best ones we can get over here. Some others can be very watery and tasteless. Any chance of a hint at the chili recipe, or is that Top Secret? Yes, a steamned bun is King. I prefer a fine dice of onion. Only an idiot would spell steamed, "steamned". you needed a Hebrew National. Matt....they are so darn salty. Nice presentation! It LOOKS good, even if some parts of it were lacking.